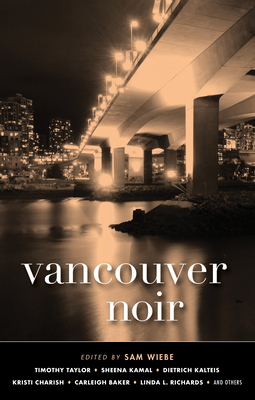 "Vancouver Noir is an excellent anthology that would appeal to short-story fans of all types--even those who don't read the genre on a regular basis...Like the earlier volumes Toronto Noir and Montreal Noir, the new anthology serves as a fantastic introduction for those unfamiliar with the genre and a reminder that Canada, bursting with amazing writers, is one of the strongest countries for crime writing in the world." "There's the Vancouver of charming neighborhoods, vast verdant parks, lovely beaches and snow-capped mountains as a backdrop to it all. But the Vancouver of the newly published Vancouver Noir collection of 14 original short stories is the unsettling underside of all that--and the project masterminds couldn't be happier." "Vancouver writer Sam Wiebe likes to describe crime fiction as the ultimate anti-travel guide. Instead of taking readers on a tour of charming local hot spots, it delivers them to the dark underbelly of a city, inviting them to follow detectives down sketchy streets and back alleys normally hidden from tourist view. According to Wiebe, if you want to really know a city, read its murder mysteries." "Vancouver's reputation is that of outdoor fun, athleisure wear clothing and craft beer. But don't be fooled by all the S'well water bottles; there's a much darker side to the city, a side that is chronicled in the new short-story anthology Vancouver Noir." "Vancouver is the noirest city in the country, and probably one of the noirest in the world. It's a port city, with its stubbornly ungentrified neighbourhoods kicking against one of the world's craziest real estate scenes, with strong Indigenous and Asian presence as a foundational urban principle, not to mention a history of gruesome crime and political intrigue... Vancouver Noir] will do the work to wrench Vancouver's identity away from the banality of real estate into something chewy, like literary murder." Akashic Books continues its award-winning series of original noir anthologies, launched in 2004 with Brooklyn Noir. Each book comprises all new stories, each one set in a distinct neighborhood or location within the respective city. Following the success of Montreal Noir and Toronto Noir, the Noir Series travels to the west coast of Canada. Brand-new stories by: Linda L. Richards, Timothy Taylor, Sheena Kamal, Robin Spano, Carleigh Baker, Sam Wiebe, Dietrich Kalteis, Nathan Ripley, Yasuko Thanh, Kristi Charish, Don English, Nick Mamatas, S.G. Wong, and R.M. Greenaway. You might wonder what shadows could exist in Vancouver, rain-spattered jewel of the Pacific Northwest. Nestled between the US border and the Coast Mountains, the city's postcard charms are familiar, even to those who've never been here, thanks to the films and TV shows shot in Hollywood North: The X-Files and Deadpool, Rumble in the Bronx and Jason Takes Manhattan. Vancouver is the so-called City of Glass. A nice place, in any case, and much too nice for noir. Looked at from afar, Vancouver may seem idyllic. But living here is different--cold and baffling and occasionally hostile. While outsiders focus on high-test BC bud, locals see a heroin crisis: Vancouver is home to the first legalized safe-injection site in North America, now heavily taxed by overdoses resulting from street drugs cut with fentanyl. It's ground zero for the National Inquiry into Missing and Murdered Indigenous Women and Girls, a nationwide catastrophe involving the deaths and disappearances of hundreds of marginalized women. Money and status trample culture and community...If Vancouver is a City of Glass, that glass is underneath our feet. Sam Wiebe is the author of the Vancouver crime novels Last of the Independents, Invisible Dead, and Cut You Down. Wiebe's work has won an Arthur Ellis Award and the Kobo Emerging Writers Prize, and he was the 2016 Vancouver Public Library Writer in Residence. His short fiction has appeared in ThugLit, Spinetingler, and subTerrain, among other places.